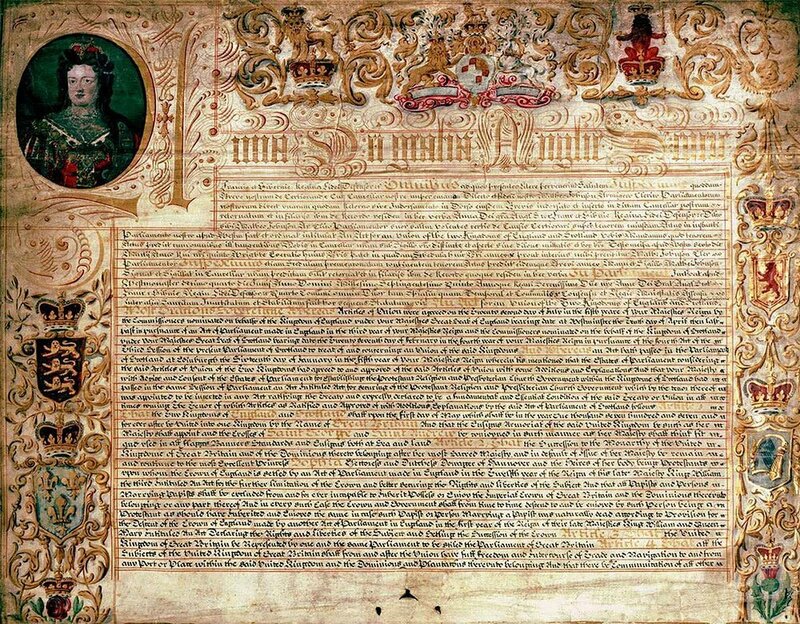 On 16th January 1707, the Scottish Parliament ratified the Treaty of Union. The ‘Union with England Act’ which approved the Treaty of Union is passed by a majority of 110 votes to 69. The English Parliament had approved the ‘Union with Scotland Act’ the previous year. The treaty contained twenty-five articles and each one had been voted on and approved before the final vote. The union would take effect on 1st May 1707. The union was an economic necessity for Scotland after years of failed harvests and near bankruptcy due to the fiasco of the Darien Scheme (1698-1700). For England, the union was a political and strategic safeguard, essentially securing its back door. Scotland kept its independence with respect to its legal and religious systems, however, coinage, taxation, sovereignty, trade, parliament, flag and armed forces became one. There were widespread protests against the union in Scotland, with riots and major disorder in many towns across the country, the worst being in Edinburgh, Glasgow and Dumfries. Outside parliament in Edinburgh, crowds burned copies of the treaty. The signed documents were sent south under military protection. Ironically it was Edinburgh, Glasgow and Dumfries that – among many other places – greatly benefited from the union and, in time, became places where the union was widely supported. Queen Anne gave royal assent on 6th March. The English Parliament ratified the treaty on 16th March. The Scottish Parliament met for the last time on 25th March and was dissolved on 28th April. The union went into effect on 1st May 1707 with the first formal meeting of the Parliament of Great Britain taking place on 23rd October 1707. 2: The succession to the throne of Great Britain will pass to the Protestant heirs of Princess Sophia of Hanover and all Papists shall be excluded from the Crown of Great Britain. 3: The United Kingdom will be represented by one and the same Parliament to be called the Parliament of Great Britain. 4: All subjects of Great Britain will have freedom of trade within the United Kingdom and with her colonies. 5: All trading ships will be registered with Customs Officers in Great Britain. 6: Great Britain will operate the same trade regulations and be liable for the same customs and duties on imports and exports. 7: The level of excise duty on liquor set across England will operate throughout Great Britain. Scotland will be exempt from duties on stamped paper, vellum and parchment. 15: Scotland will receive the sum of £398,085 10s sterling, known as the Equivalent. 16: Great Britain will use the same currency. Coins minted in Scotland will have the same value as those minted in England. 17: Great Britain will use the same form of weights and measures. The Scottish system will be abolished and replaced with the English system. 18-19: Scotland will keep its own separate laws, legal system and courts of law. 20-21: The Royal Burghs of Scotland and those holding heritable jurisdictions i.e. posts and offices granted for life, will have their rights and privileges preserved after union. 22-23: Scotland will be represented by 16 peers in the House of Lords and 45 members of Parliament in the House of Commons in the first Parliament of Great Britain. Scottish peers will have the same privileges as English peers. 24: After the Union, there will be one Great Seal for Great Britain but Scotland will retain use of the Great Seal of Scotland for matters relating to private rights or grants. The Scottish Crown, Sceptre and Sword of State and all Scottish public and private records will be kept and will remain in Scotland. 25: The final article revokes all previous acts that might operate against the union and confirms the full authority of law in passing the Act of Union.